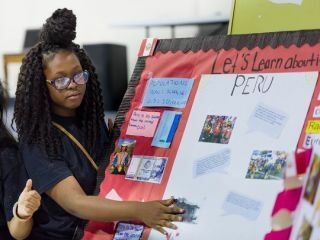 The students of the Serviam Girls Academy took a trip around the world this summer, learning about countries across the globe without leaving Delaware. The New Castle area Catholic middle school, which educates low-income girls tuition-free, has a mandatory summer session every July, but, this year, the school added a month-long project to the curriculum that had students researching and exploring countries from Europe to South America. They celebrated the end of the session with international food and presentations on each country for their parents this week. Having the summer classes, which cover all the usual subjects, is a way to keep students engaged in their studies, but, this year, "we wanted to make it a little more fun, because that's what learning should be, especially in July," said Kate Lucyk, principal of the school. The girls, who are in grades five through eight, dressed in clothes related to their countries and darted around the school gym with their siblings, alighting on an exhibit about New Zealand one moment and Peru the next. 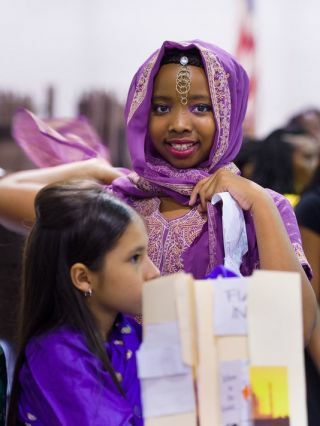 Sydney Brown, 10, studied India and stood in front of her exhibit in a sari, a table full of food behind her. "I love to cook," she said, "because it's fun and it's messy." She always does the clean up after the cooking, Brown said. For this project, she learned to make chapati bread and memorized the recipe – one cup of wheat flour, one cup of all-purpose flour, one teaspoon olive oil, and three-quarters of a cup hot water, she said, reciting the ingredient list with her hands clasped in front of her. Part of the idea behind the project is to widen the view that the girls have of the world. "When you're in middle school, your world is such a little bubble," said Lucyk. So, spending a month exploring another part of the world introduces students to new things and also helps them understand their own country in a different way. Paige Ponzo, 12, was surprised to learn that her country had such a long reach – she spent the last month studying American Somoa, a U.S. territory in the Pacific Ocean. "It's interesting to find out that your country is connected to another place," she said. Her friend, Breajah Bordley, 14, studied New Zealand. What did she think was the most interesting thing about it? "The size," Bordley said, standing next to a map that had the tiny island placed smack dab in the middle of the United States, not even covering the whole of the heartland. "They're this little thing – they're isolated," said Zoe Abe, 13, who also worked on the New Zealand project. That's why they invented extreme sports, Abe said, explaining that they're out there all by themselves, so they try new things. It's interesting to see how differently the fifth graders approach the project and understand the things they learn compared to the eighth graders, said Lucyk. "It's amazing how mature a mind can get over four years," she said.